After the success of last year's Skate Copa, adidas skateboarding takes the first-of-its-kind skate shop contest global in its second year. 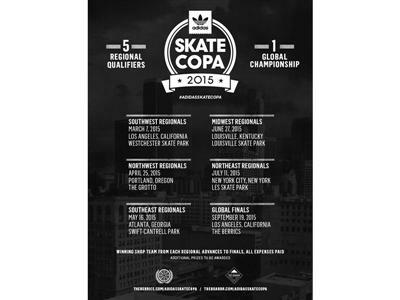 For 2015, Skate Copa expands from its 100 plus competing U.S. skate shops to an ambitious global competition held in multiple cities within the United States and around the world. 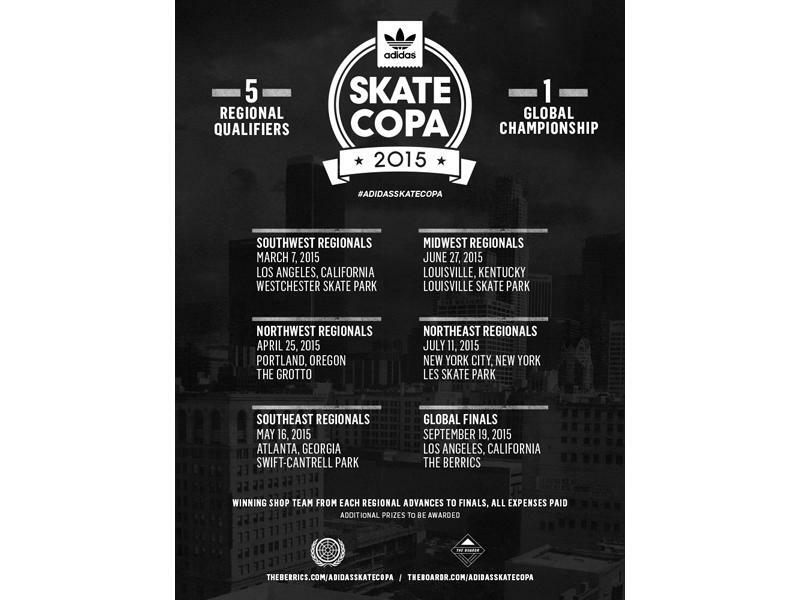 With more than twenty thousand dollars in prize purse money at stake, Skate Copa kicks off on March 7 in Los Angeles at Westchester Skate Park and concludes with a global finals event taking place at The Berrics on September 19.
International teams will compete in their respective countries for a chance to advance to the global finals event where they will skate against five winning US teams for a ten thousand dollar prize purse and the coveted title of Skate Copa Global Champion. In tandem with Skate Copa 2015, adidas skateboarding is launching BOOST technology in two of its most advanced skate shoes to date — the ADV BOOST and the Dorado BOOST. Each Skate Copa stop will feature BOOST The Bar —a bump-to-bar best trick event inspired by the skate-specific applications of BOOST technology. The custom built BOOST The Bar obstacle will be on site at each event and open to everyone to skate in an all-out-best trick jam for cash prizes and BOOST prize packages.